Glucose-based peritoneal dialysate (PD) is responsible for increased accumulation of advanced glycation end products (AGE) in the peritoneum of continuous ambulatory peritoneal dialysis patients. Pyridoxal 5′-phosphate (PLP), a derivative of vitamin B6, protects proteins from glycation. Hepatocyte growth factor (HGF) heals damaged tissues in a reciprocal manner against TGF-β1. First, with the use of gas chromatography-mass spectrometry, whether PLP traps 3-deoxyglucosone (3DG), a major glucose degradation product in PD, was determined. Then, whether rat peritoneal tissue damages induced by intraperitoneal administration of glucose-based PD is ameliorated by PLP or HGF was examined. 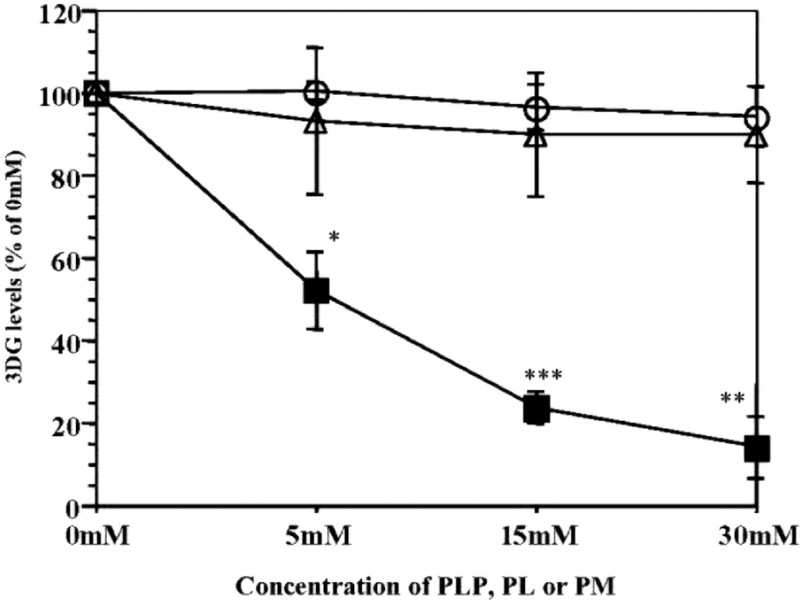 In vitro incubation with PLP markedly decreased concentration of 3DG in a dose-dependent manner, demonstrating the 3DG-trapping effect of PLP. The peritoneum of PD-treated rats was significantly thickened compared with that of physiologic saline-treated rats. Both PLP and HGF prevented the thickening of rat peritoneum induced by PD and ameliorated accumulation of AGE and expression of TGF-β1, vascular endothelial growth factor, and type 1 collagen and a number of blood vessels. Furthermore, expression of HGF was significantly increased in the peritoneum of PLP-treated rats compared with that of PD-treated rats. In conclusion, PLP shows 3DG-trapping effect. PLP and HGF prevented peritoneal thickening; accumulation of AGE; expression of TGF-β1, vascular endothelial growth factor, and type 1 collagen; and neoangiogenesis in rat peritoneum induced by PD. Long-term peritoneal dialysis contributes to functional and structural deterioration of peritoneal membrane. Glucose-based peritoneal dialysate (PD) contains high levels of glucose degradation products (GDP) formed during heat-sterilization procedure, and these GDP may readily react with proteins and accelerate accumulation of advanced glycation end products (AGE) (1,2). Accumulation of AGE is associated with peritoneal dysfunction in continuous ambulatory peritoneal dialysis (CAPD) patients (3,4). Thus, the prevention of AGE accumulation in the peritoneum is necessary for maintenance of long-term CAPD. New PD solutions with reduced contents of GDP—for example, amino acid-based PD (5), filter-sterilized fluids (6), and two-chambered PD—have been developed to keep glucose separated from buffer before use (7). These PD solutions are expected to reduce tissue damage and accumulation of AGE in the peritoneum. However, alternative strategies, such as administration of AGE inhibitors or the agents that promote tissue repair, should also be developed. Some AGE inhibitors exert beneficial effects on diabetic complications in animal models (8) mainly by trapping reactive dicarbonyls that are produced during persistent hyperglycemia (9). However, such inhibitors could be toxic for living tissues because they also trap vitamin B6 and neuron-transmitting substances, resulting in vitamin B6 deficiency symptoms such as seizure attacks. Therefore, safe drugs should be developed for the treatment of AGE-related disease. Recently, pyridoxamine (PM), a vitamin B6 derivative, was demonstrated to inhibit formation of AGE, especially by blocking postamadori processes (10), and to inhibit the development of diabetic complications and vascular disease in animal models (11,12). Its dicarbonyls-trapping effect also accounts for inhibition of AGE formation (13). Pyridoxal 5′-phosphate (PLP) is another derivative of vitamin B6, which protects proteins from glycation (14–16), although its mechanism is not yet elucidated. Hepatocyte growth factor (HGF) heals damaged organ in a reciprocal manner against TGF-β1 (17). We previously demonstrated that increased expression of HGF was focally detected in the peritoneal tissues of CAPD patients with low ultrafiltration capacity compared with those with normal ultrafiltration capacity (18). In this study, we determined whether PLP traps 3DG, because 3DG is a major GDP in PD formed during heat sterilization (19) and is a precursor of AGE such as imidazolone (20). Furthermore, we examined whether intraperitoneal administration of PLP and HGF shows beneficial effects on PD-induced peritoneal damage, by assessing morphologic changes, the accumulation of AGE, and expression of growth factors in the peritoneum. To determine whether PLP traps GDP, we incubated 3DG (molecular weight 162.1; Dojindo Laboratories, Kumamoto, Japan) with PLP (molecular weight 247.1; Sigma-Aldrich, St. Louis, MO) in vitro. In brief, 3DG (30.8 μM) in 0.1 M phosphate buffer was incubated with PLP at concentrations of 5, 15, and 30 mM at 37°C for 24 h. 3DG solution without PLP was kept immediately at −30°C until measurement. For comparing the 3DG-trapping ability of PLP with the other vitamin B6 derivatives, pyridoxal (PL) hydrochloride (molecular weight 203.6; Sigma-Aldrich) and PM dihydrochloride (molecular weight 241.1; Sigma-Aldrich) at the same concentrations as PLP were incubated with 3DG solution. After 24 h of incubation at 37°C, all samples were kept immediately at −30°C. 3DG concentration was measured by gas chromatography-mass spectrometry, according to the method previously described (21). Sprague-Dawley rats (7 wk old, male, 240 to 250 g) were allowed free access to food and water and were divided into four groups (seven rats per group): (1) physiologic saline (PS) group given 20 ml of PS, (2) PD group given 20 ml of PD (Dianeal PD-2, 2.5% glucose; Baxter Healthcare Corp., Round Lake, IL), (3) PLP group given 20 ml of PD that contained 50 mg of PLP (10.1 mM), and (4) HGF group given 20 ml of PD that contained 1 μg of HGF (Pepro Tech EC Ltd., London, UK). The concentration of 3DG in unused PD was 0.26 mM. All solutions were administered intraperitoneally to the rats once a day for 28 d. A rat that was treated with HGF was excluded from the study because it died of unknown cause on the 25th day after starting the experiment. Then, all of these rats were anesthetized and their visceral peritoneum including colons and parietal peritoneum along with muscles were excised. Tissues were cut into pieces and kept in phosphate-buffered formaldehyde solutions for 3 d. After fixation, these peritoneal tissues were embedded in paraffin, and thin sections (3 to 4 μm) were obtained for periodic acid-Schiff staining and immunohistochemical staining for AGE, growth factors, and extracellular matrix protein. The experimental protocol was approved by the Animal Care Committee of Nagoya University Hospital. After paraffin was removed from cut sections, they were treated with boiled citrate buffer (10 mM, pH 6.0) for 10 min before the staining of AGE, blood vessels, and type I collagen. Regarding growth factors, the sections were treated by diluted proteinase K solution (0.01 mg/ml) for 10 min before staining. An avidin-biotin coupling technique was applied to all cases of immunostaining. For detecting AGE in the peritoneum, a monoclonal anti-imidazolone antibody (1:100) and a monoclonal anti-Nε-(carboxymethyl) lysine (CML) antibody (1:200) were prepared. These two anti-AGE antibodies were produced at our laboratory, and their epitopes and reactivity were characterized (20,22). For determining the expression of TGF-β1, HGF, and vascular endothelial growth factor (VEGF), a polyclonal anti-TGF-β1 antibody, a polyclonal anti-HGFα antibody, and a monoclonal anti-VEGF antibody (1:20; Santa Cruz Biotechnology, Santa Cruz, CA) were used, respectively. For clarifying the location of blood vessels, a polyclonal anti-von Willebrand factor antibody (1:200; DAKO, Glostrup, Denmark) was used. Localization of type I collagen in the peritoneum was detected using a polyclonal anti-rat collagen I antibody (1:20; Sanbio bv, Am Uden, Netherlands). 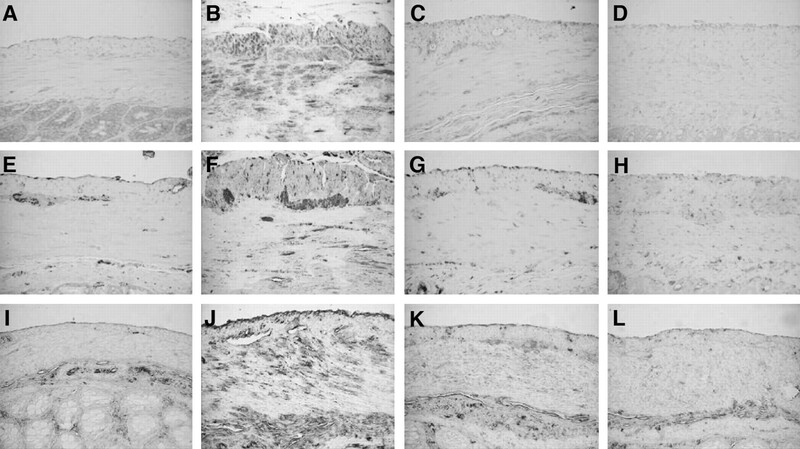 To assess histologic alterations and to quantify accumulation of AGE and expression of growth factors and type I collagen in the peritoneum, we used colon segments surrounded by the visceral peritoneum. We measured thickness of these visceral peritonea including outer muscle layers. In brief, we put light microscopic pictures of the peritoneum taken on 10 different locations per section into a computer memory board using a digital camera (DN100; Nikon, Tokyo, Japan) and measured the thickness of the outer layer in each picture in a blind manner using NIH Image 1.62. The average value of 10 measurements was adopted as representative of the case. To evaluate the accumulation of AGE and expression of growth factors in the visceral peritoneum, we took immunostaining pictures of imidazolone, CML, TGF-β1, HGF, VEGF, and type I collagen at 10 different locations and randomly measured their positive areas per 1-mm length of the visceral peritoneum including outer muscle layer using the NIH Image 1.62. We counted the number of blood vessels per 1-mm length of the peritoneum at 10 different locations, and the average number of them was adopted as a representative value. When there were no significant differences among the four groups using the visceral peritoneum, similar measurement was performed using the parietal peritoneum. When using the parietal peritoneum, positive area and the number of blood vessels were measured up to the depth of 300 μm from the peritoneal surface. Results are expressed as mean ± SD. One-way ANOVA was performed to determine whether parameters differed among the four groups. When there were significant differences by ANOVA, Fisher protected least significant difference test was used for further analysis between groups. P < 0.05 was considered significant. 3DG-trapping effect was determined after a 24-h incubation of 3DG with PLP, PL, or PM. The concentration of 3DG was decreased in samples that were incubated with PLP (Figure 1). PLP decreased 3DG levels to 52.2% at 5 mM, 23.7% at 15 mM, and 14.0% at 30 mM, respectively. PL did not decrease 3DG levels as follows: 100% at 5 mM, 96.4% at 15 mM, and 94% at 30 mM, respectively (Figure 1). PM hardly decreased 3DG levels to 93.1% at 5 mM, 89.7% at 15 mM, and 89.6% at 30 mM, respectively (Figure 1). Thus, only PLP exerted 3DG-trapping effect. The visceral peritoneal layer was significantly thickened in the PD group as compared with the PS group. Administration of PLP and HGF inhibited peritoneal thickening induced by PD (Table 1, Figure 2). AGE such as imidazolone and CML were accumulated in the visceral peritoneum of the PD group, whereas only a small positive area was noted in the PS group (Table 1, Figure 3, A, B, E, and F). Administration of PLP significantly attenuated accumulation of imidazolone and CML in the visceral peritoneum (Table 1, Figure 3, C and G). Administration of HGF also attenuated accumulation of AGE in the peritoneum, although not so remarkably as PLP (Table 1, Figure 3, D and H). Intraperitoneal administration of PD increased the positive area of type I collagen in the visceral peritoneum as compared with the PS group (Table 1, Figure 3, I and J). Administration of PLP and HGF significantly decreased the positive area of type I collagen in the peritoneum as compared with the PD group (Table 1, Figure 3, K and L). Light microscopic pictures of periodic acid-Schiff staining of the visceral peritoneum. (A) The peritoneum of a rat that was treated with physiologic saline (PS). (B) The peritoneum of a rat that was treated with peritoneal dialysate (PD). (C) The peritoneum of a rat that was treated with PD that contained PLP. (D) The peritoneum of a rat that was treated with PD that contained hepatocyte growth factor (HGF). Magnification, ×50. Light microscopic pictures of imidazolone, Nε-(carboxymethyl)lysine (CML), and type 1 collagen accumulation in the visceral peritoneum. (A) Imidazolone in the peritoneum of a rat that was treated with PS. (B) Imidazolone in the peritoneum of a rat that was treated with PD. (C) Imidazolone in the peritoneum of a rat that was treated with PD that contained PLP. (D) Imidazolone in the peritoneum of a rat that was treated with PD that contained HGF. (E) CML in the peritoneum of a rat that was treated with PS. (F) CML in the peritoneum of a rat that was treated with PD. (G) CML in the peritoneum of a rat that was treated with PD that contained PLP. (H) CML in the peritoneum of a rat that was treated with PD that contained HGF. (I) Type I collagen in the peritoneum of a rat that was treated with PS. (J) Type I collagen in the peritoneum of a rat that was treated with PD. (K) Type I collagen in the peritoneum of a rat that was treated with PD that contained PLP. (L) Type I collagen in the peritoneum of a rat that was treated with PD that contained HGF. Magnification, ×100. Expression of TGF-β1 was much more prominent in the PD group than in the PS group. Administration of PLP and HGF inhibited its expression in the visceral peritoneum. The inhibitory effect of TGF-β1 was more prominent in the HGF group than in the PLP group (Table 1, Figure 4, A through D). It is interesting that marked HGF expression was noted in the peritoneum of the PLP group compared with that of the PD group, whereas its expression did not differ between the PD and the PS groups (Table 1, Figure 4, E through H). The intensity of VEGF expression and the number of blood vessels in the visceral peritoneum did not differ among the four groups (data not shown), so they were reassessed using the parietal peritoneum. Expression of VEGF was increased in the peritoneum of the PD group as compared with the PS group. Administration of PLP and HGF reduced expression of VEGF as compared with the PD group (Table 1, Figure 5, A through D). The number of blood vessels was increased in the parietal peritoneum of PD-treated rats than in PS-treated rats. Administration of PLP and HGF significantly inhibited an increase in the number of blood vessels in the peritoneum as compared with the PD group (Table 1, Figure 5, E through H). 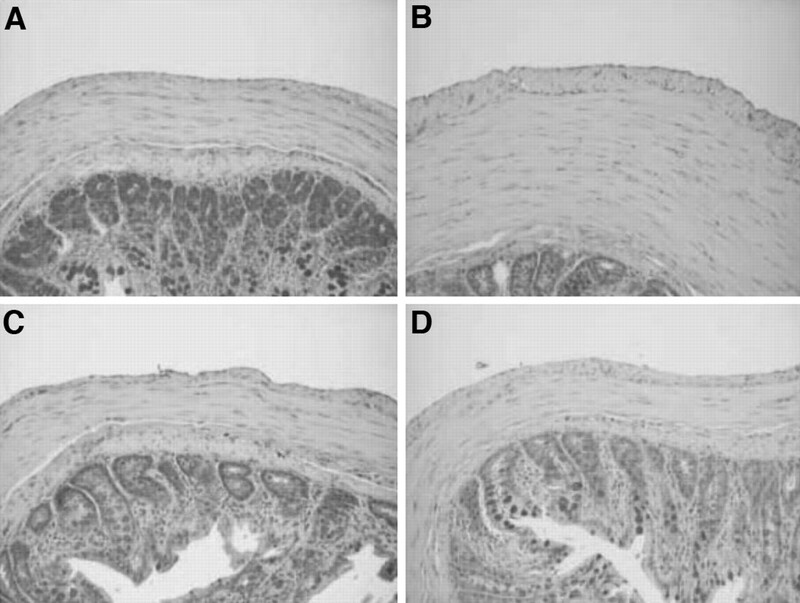 Light microscopic pictures of TGF-β1 and HGF expression in the visceral peritoneum. (A) TGF-β1 in the peritoneum of a rat that was treated with PS. (B) TGF-β1 in the peritoneum of a rat that was treated with PD. (C) TGF-β1 in the peritoneum of a rat that was treated with PD that contained PLP. (D) TGF-β1 in the peritoneum of a rat that was treated with PD that contained HGF. (E) HGF in the peritoneum of a rat that was treated with PS. (F) HGF in the peritoneum of a rat that was treated with PD. (G) HGF in the peritoneum of a rat that was treated with PD that contained PLP. (H) HGF in the peritoneum of a rat that was treated with PD that contained HGF. Magnification, ×100. Light microscopic pictures of vascular endothelial growth factor (VEGF) expression and blood vessels in the parietal peritoneum. (A) VEGF in the peritoneum of a rat that was treated with PS. (B) VEGF in the peritoneum of a rat that was treated with PD. (C) VEGF in the peritoneum of a rat that was treated with PD that contained PLP. (D) VEGF in the peritoneum of a rat that was treated with PD that contained HGF. (E) Blood vessels in the peritoneum of a rat that was treated with PS. (F) Blood vessels in the peritoneum of a rat that was treated with PD. (G) Blood vessels in the peritoneum of a rat that was treated with PD that contained PLP. (H) Blood vessels in the peritoneum of a rat that was treated with PD that contained HGF. Magnification, ×50. AGE are considered to be involved in diabetic complications and aging, and their accumulation in living tissues leads to pathologic tissue damage and organ dysfunction (8,23). Glucose-based PD is toxic for mesothelial cells, stimulating them to release growth factors and to produce matrix proteins in which both high glucose and GDP are involved (24). High levels of GDP produced in PD during the heat-sterilization process accelerate formation of AGE (2). The localization of AGE detected using the antibodies against CML and imidazolone was identical with that of growth factors, and the intensity of accumulation was associated with peritoneal dysfunction (18). Thus, accumulation of AGE in peritoneal tissues is associated with peritoneal histologic alterations and ultrafiltration failure in CAPD patients. AGE alter cellular functions, including signal transduction pathway (25), and induce expression of various growth factors, resulting in peritoneal sclerosis and/or fibrosis with a loss of ultrafiltration. Reduction of GDP levels may protect the peritoneum from accumulation of AGE in the peritoneum. Because hydrazine compounds such as aminoguanidine and OPB-9195 trap PL and consequently induce vitamin B6 deficiency, they are not yet used for the treatment of AGE-related disorders such as diabetic complications (26). Vitamin B6 itself has been known to show preventive effects on coronary heart disease (27) and diabetic retinopathy (28). Recently, a vitamin B6 derivative, PM, was demonstrated to inhibit AGE formation and lipid peroxidation reaction (10,29,30). Moreover, this agent prevented the development of diabetic complications and hyperlipidemia in experimental rats (11,12). PLP competes with sugars for Schiff base formation with protein amino groups (31,32), especially with an active lysine residue (33,34). Namely, decreased accumulation of CML can be explained by the binding of the aldehyde group in PLP to protein amino groups, protecting the peritoneum from modification by CML. However, the inhibition of imidazolone accumulation needs another mechanism, because imidazolone mostly arises from 3DG as its precursor (20). In this study, we compared 3DG-trapping ability among the three vitamin B6 derivatives and first discovered a remarkable 3DG-trapping capability of PLP compared with the other vitamin B6 derivatives, PL and PM. Decreased accumulation of imidazolone in the PLP group seems to be caused by its 3DG-trapping effect that is one of the characteristics of PLP. The inhibitory effect of glycation differs between PLP and PL (14). In the present study, we could not confirm the precise mechanism of PLP to trap 3DG; however, it is certain that the 3DG-trapping ability differs between PLP and PL, suggesting that the phosphate group in PLP structure plays an important role in the process of trapping 3DG. TGF-β1 is a predominant fibrogenic factor that simultaneously suppresses HGF production in a reciprocal manner (17,35,36). VEGF induces vascular fenestrations (37,38), hyperpermeability (39,40), and neovascularization in the peritoneum of experimental animals (39,40) and CAPD patients (41). In the experiment of gene transfer to the rat peritoneum, TGF-β1 induced submesothelial zone thickening and decreased ultrafiltration, and the exposure to TGF-β1 increased VEGF expression by mesothelial cells (39). Recently, it was demonstrated that expression of VEGF is upregulated by not only glucose but also GDP (24,42) and glycated proteins (43). A recent immunohistochemical approach using serial sections revealed that AGE promote expressions of TGF-β1 and VEGF and that the proliferation of myofibroblasts plays a crucial role in morphologic peritoneal alterations and low ultrafiltration capacity in CAPD patients (18). In the present study, imidazolone and CML were co-localized with TGF-β1 and VEGF. It is noteworthy that administration of PLP significantly attenuated the expression of these growth factors. Moreover, administration of PLP decreased the number of blood vessels and expression of VEGF in the peritoneum. Thus, PLP inhibits AGE modification of the peritoneum and consequently attenuates the expression of growth factors and neoangiogenesis. On the basis of reciprocal balance between TGF-β1 and HGF, a suppression of TGF-β1 increases HGF expression in the peritoneum of PLP-treated rats. HGF plays a crucial role in the repairing process of tissues (44,45). In experimental renal disease, the therapeutic value of HGF was established at relatively high doses of 500 μg to 5 mg/kg per d (17,46,47). In our study, HGF significantly prevented the development of histologic alterations in the rat peritoneum induced by PD injection at a lower dose of 4 μg/kg per d. Direct administration of HGF on targeting tissue may save its therapeutic dose, and the present study provides a new prospect for HGF therapy. Production of angiogenic cytokine increases after TGF-β1 exposure (39). Inhibition of TGF-β1 expression may suppress VEGF production, resulting in decreased neoangiogenesis. Unexpectedly, accumulation of AGE was significantly reduced in the peritoneum of rats that were treated with HGF. As shown in Table 1 and Figure 2, the proliferation of type I collagen in the peritoneum of PD-treated rats was clearly inhibited by treatment with HGF as well as PLP. Moreover, that inhibition was more prominent in HGF-treated rats than in PLP-treated rats. We speculate that treatment with HGF inhibits proliferation of extracellular matrix, a target for AGE modification, in the peritoneum and consequently reduces accumulation of AGE in extracellular matrix. In summary, we demonstrated for the first time that PLP inhibits formation of AGE by trapping 3DG. More notable, PLP and HGF prevented the progression of histologic alterations in the peritoneum induced by PD. PLP and HGF are expected to be useful for preventing the development of peritoneal damage in patients who are on long-term CAPD, although further studies are indispensable.